As you may (or may not) know, I have a particular fondness for Apes. Gorillas in particular. 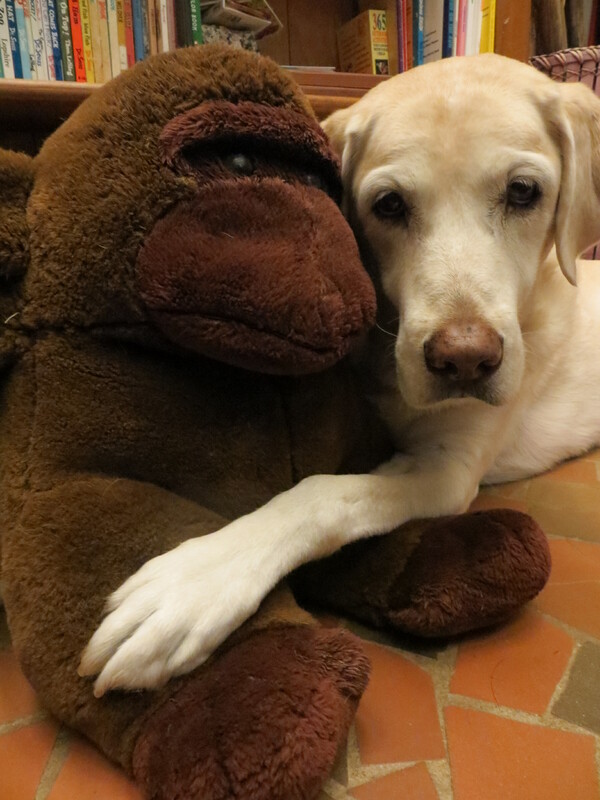 My sleeping buddy when i was a wee pup was a cuddly gorilla who kept me safe at night. 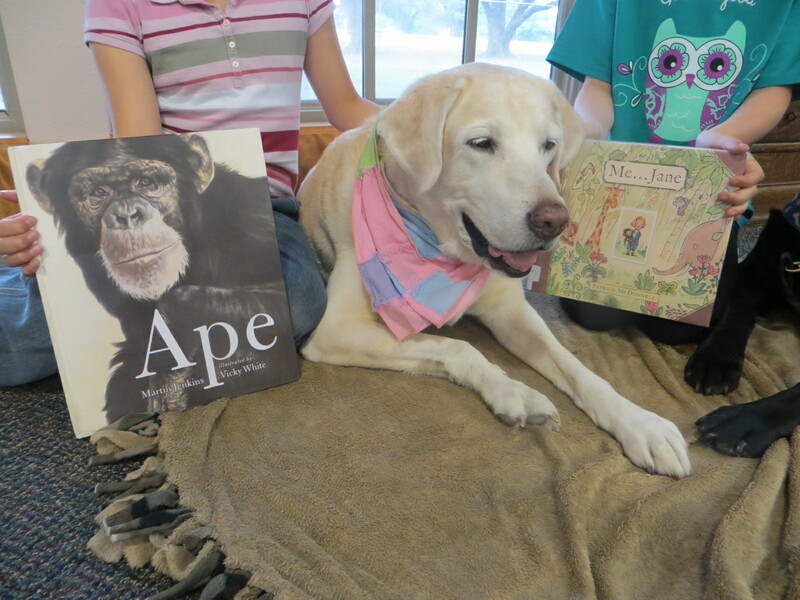 I have talked about apes and ape books on several occasions. HERE. and HERE. and HERE. and HERE. One of my most favorite author/illustrators is Mr. Anthony Browne who is quite famous for his depictions of apes. Do you know the difference between apes and monkeys? Apes don’t have tails! Today for Perfect Picture Book Friday, I have two, yes TWO, Perfect Picture Books about Apes. One is non-fiction and one is considered fiction but is actually a biography. I get so confused about these things sometimes! There are five kinds of great apes in the world. but not so very different. They’re all part of the same family. Mr Jenkins goes on to tell us about the great apes of the world. The Orangutan of Borneo and Sumatra, the Chimpanzee of central and west Africa, the Bonobo of central Africa, the Gorilla of central Africa, and ….. Humans who are found all over the world. At the back of the book is a world map showing where the Great Apes are found, and links to some conservation organizations who are working to save the great apes. This is a most incredible book! You can read Publishers Weekly’s review HERE. Jane had a stuffed toy chimpanzee named Jubilee. She cherished Jubilee and took him everywhere she went. And Jane loved to be outside. This is an exquisitely joyful look at Jane Goodall as a wee young girl. She spends her time immersed in the world around her. She is a watcher of nature – the plants and animals that fill her habitat. She studies and keeps detailed notes in her journals. 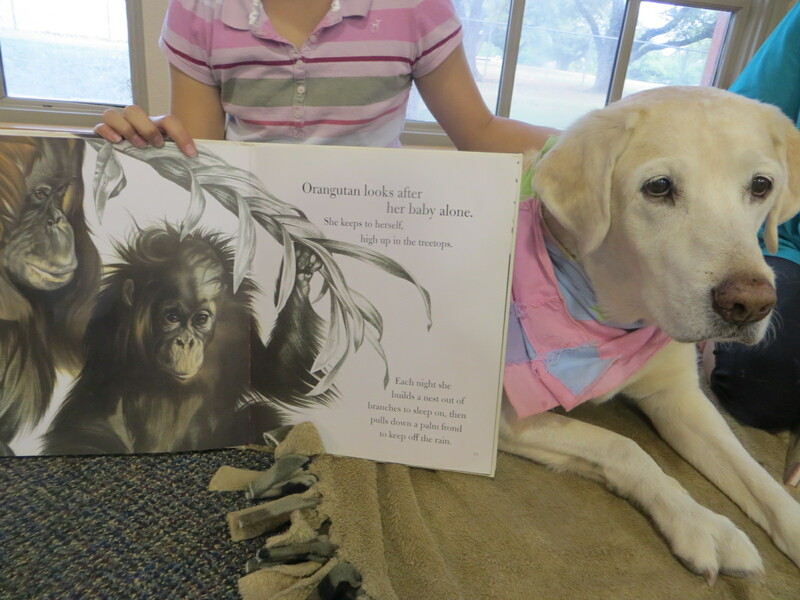 Jane reads about Tarzan of the Apes and dreams of being in Africa herself living a life “with, and helping, all animals.” And Jubilee is with her always. The illustrations in this book are the cute, sweet pictures that Mr McDonnell is famous for. But there are also some of Jane’s own artwork from her journals. And pages of subtle realistic nature pictures. At the back of the book is a brief biography about Ms Goodall and links to her websites. You can get to those HERE. and HERE. There is also a message from Ms Goodall herself. Besides learning about chimpanzees at Ms Goodall’s website, you can find more about gorillas at the Gorilla Organization. More about orangutans at the Orangutan Foundation. More about Bonobos at the Bonobo Conservation Initiative. Here is a link to some activity sheets and a cool gorilla mask. A great lesson plan about apes with crafts and activities can be found HERE. 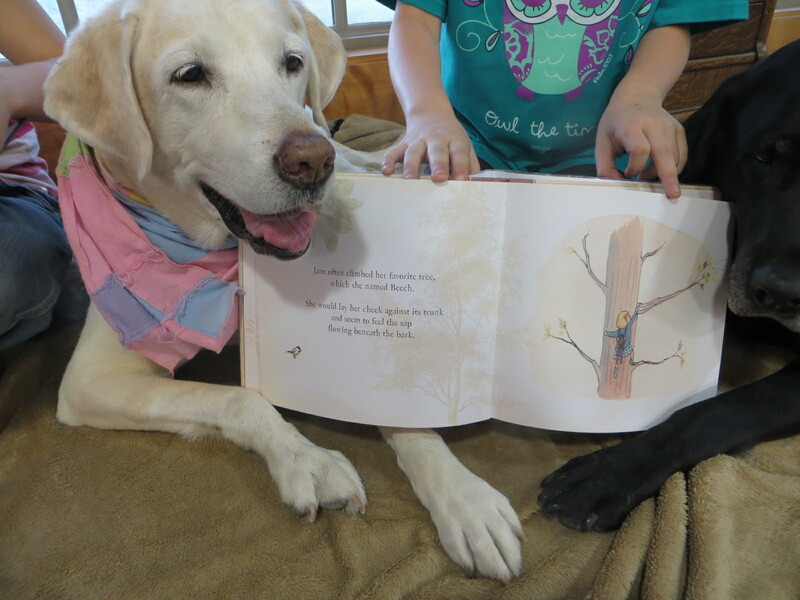 And now you might want to visit Susanna Hill’s blog where you’ll find a great list of Perfect Picture Books and helpful resources to go with. Now go out and do something good for your neighborhood! 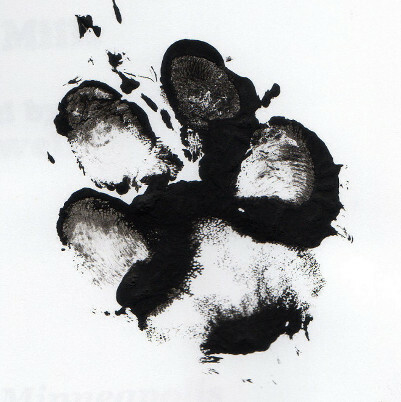 This entry was posted in children's books, PPBF, reading dogs and tagged bonobos, chimpanzees, gorillas, Great Apes, Jane Goodall, Martin Jenkins, orangutans, Patrick McDonnell, PPBF, reading dogs, Susanna Hill, Vicky White by readingwithrhythm. Bookmark the permalink. 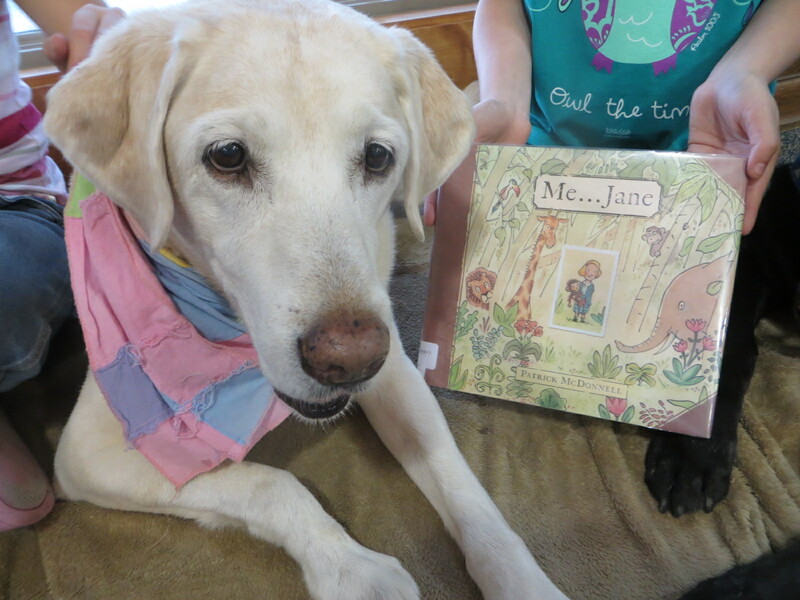 I love “Me Jane” – what a fun book about a woman who changed – and continues to change – the world for the better. Haven’t seen “Apes” yet, so will look for it. Isn’t Ms Goodall just an incredible lady?! Thanks Misaki! Don’t you have an ape friend too? Ivan has been on my list for ever so long, but I haven’t found anyone to read it to me yet. It seems to be always checked out of the library! I visited Norman’s blog and I think that I like him too! Thanks for introducing him to me! And I guess I’d best read some Marty McGuire books! I’m not familiar with those. Thanks! No tails? I wonder what the apes wag when they’re happy…..
PS – I love your scarf. Looks like spring! I have wondered the same thing. I think they must be kind of like a corgi wagging their whole butts. Or maybe more like our humans who laugh out loud and wag their whole bodies. What an adorable post. I too love gorillas though I slept with a rabbit! Thanks Ms Marple! I like rabbits too! But I’ve never slept with one. Love your selection because I like apes. Love the video! Thanks Ms Tilton! That Ms Goodall is quite an inspirational being. 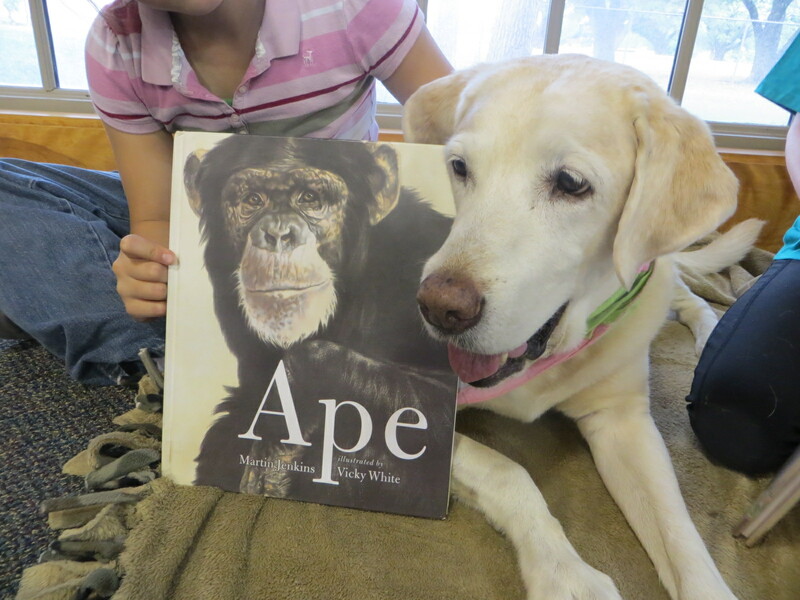 Thanks for bringing these two books to all of us, and the video of Jane Goodall! And all the great link info on the apes!